Alaska by Land and Sea | Cooking Wine And Travel - The site where Foodies Unite! Alaska is one of the most beautiful and magical places in the world. It is a vast and unspoiled wilderness that is illuminated by spectacular northern lights and home to a richly diverse native culture. Hailed as "the land of the midnight sun", Alaska is the largest state in the U.S. and has a longer coastline than all the other U.S. states combined. Alaska is bordered by the Yukon Territory and British Columbia in Canada, to the east, the Gulf of Alaska and the Pacific Ocean to the south, the Bering Sea, Bering Strait, and Chukchi Sea to the west and the Arctic Ocean to the north. If you check a map you will discover that Alaska has the unique distinction of being the westernmost, easternmost and northernmost state in the United States. Because of its immense size and remote location, most people visit Alaska by cruise ship. Most cruises travel for 7 days between Seward to the North and either Seattle or Vancouver to the south (you can choose from a southbound, northbound or round-trip itinerary). While cruises are the most efficient way to see some of the beauty of Alaska, the best part of Alaska is seen before and after you get on the cruise ship. I recommend that you spend at least 3-4 days at both ends of the cruise and visit inland destinations, such as Victoria to the south and the Denali National Forest, Prince William Sound and the Kenai River basin to the north. These are some of the most beautiful places in the world, and you will be remiss if you do not take the time to see some of these areas, especially since you may not likely make the trek to this part of the world again. Vancouver is one of my favorite cities. The local architecture and landscaping are some of the most unique and exquisite examples of beautified urban living anywhere in the world. It is an outdoor living mecca that includes a large public park that sits on a peninsula in the middle of town called Stanley Park. You really should plan a day, pack a picnic lunch and rent bikes to ride the entire park. There are some great neighborhood grocery stores where you can buy drinks and sandwiches to go, and there are bike rental store at the entrance to the Park. Another great day trip is to cross over the Lionsgate Bridge and take the Sea to Sky Highway to Whistler. Go early and plan to have lunch there. The village is stunning and the highway is one of the most scenic drives in North America. You should also take the opportunity to visit Victoria, the capital city of British Columbia, Canada. Victoria and is located on the southern tip of Vancouver Island off Canada´s Pacific coast and is about 62 miles from both Seattle and Vancouver and can be accessed and by airplane, ferry, or the Victoria Clipper passenger-only ferry. Named after Queen Victoria of the United Kingdom, Victoria is one of the oldest cities in the Pacific Northwest. The British settlement of this area began in 1841 and the city has retained a large number of its historic buildings. The two most famous landmarks are the British Columbia Parliament Buildings (finished in 1897) and the Empress hotel (opened in 1908). The city´s Chinatown is the second oldest in North America after San Francisco´s. 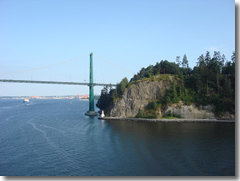 Known as the "City of Gardens," Victoria is a beautiful city and a popular tourism destination. 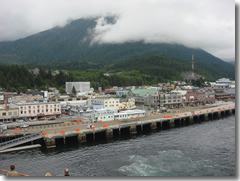 Ketchikan sprawls along the coast of Revillagigedo Island for several miles, and is the where most cruise lines start or end your Alaska vacation. This is the least impressive of the cities you will visit and there is not much to do other than walk around the tourist shops. The city is centered on one road, Tongass Avenue, which runs along the shores of Tongass Narrows and sometimes over it, supported by pillars. Many businesses and homes are suspended above the water or cling to the hillside and have winding staircases or wooden streets leading to their front doors. Ketchikan is a bustling community backed by forested hills and surrounded by a waterway that hums with floatplanes, fishing boats, ferries and large cruise ships. To the south is the distinctively shaped Deer Mountain. The best way to explore Ketchikan is on foot with a walk around the city center. Start at the busy City Dock with a stop at the Visitor Bureau to pick up a Ketchikan Walking Tour Map. The new Southeast Alaska Visitor Center, maintained by the U.S. Forest Service, is an impressive facility. Three huge totems greet you in the lobby while a school of several dozen silver salmon suspended from the ceiling lead to the exhibit hall and a slice of rainforest. Creek Street is not so much a street as a boardwalk built on pilings and was the famed red-light district for half a century, until 1954 when the profession became illegal. During its heyday, Creek Street supported up to 30 brothels. The first house, with its bright red doors and windows, is Dolly´s House, the parlor of the city´s most famous madam, Dolly Arthur. The former business is now a museum dedicated to this infamous era. There are another 20 buildings on Creek Street including small shops and a restaurant. If the salmon are spawning, you can watch them swim up Ketchikan Creek beneath the pilings. If the salmon are running while you are there it is an impressive site to see them under the bridges and around the Creek St piers. The Totem Heritage Center serves as the place where totem poles salvaged from deserted Tlingit communities are gathered and restored to their original condition. The collection totals more than 30, the largest in Alaska. Five of the poles are on display in the central gallery along with indigenous art and a Southeast Alaskan fish camp from the 1920s. The Deer Mountain Hatchery is a fascinating place where biologists annually raise 150,000 king salmon and an equal number of Coho. Observation platforms, outdoor displays and friendly workers provide an interesting lesson in the salmon´s life cycle. Take in the daily performance of Alaska Native dancers and sample smoked salmon while you are there. Enjoy a climb up Upland Way stairs to a viewing platform overlooking the city center, Thomas Basin boat harbor and Creek Street. Continue on to a fish ladder at Ketchikan Creek´s falls. It is a magnificent sight when these fish leap against the current during the late summer spawn. Next to the bridge is one end of Married Man´s Trail, a delightful boardwalk that leads back to Creek Street. If you like Alaskan King Crab legs I recommend you try Steamers. It is directly across the street from the Cruise ship. Very casual and a great selection of hand made beers. Juneau the capital of Alaska, residents claim it is the most scenic capital in the country and it is often referred to as a ´little San Francisco.´ I think this is an over-statement, but it is probably one of the better stops you will have. The city center, which hugs the side of Mt. Juneau and Mt. Roberts, has many narrow streets running past a mixture of new structures, old storefronts and slanted houses, all held together by a network of staircases. The bustling waterfront features cruise ships, tankers, fishing boats, a few kayakers and floatplanes buzzing in and out. Overhead are the snow-capped peaks of Mt. Roberts and Mt. Juneau, which provide just a small part of the superb hiking in the area. Founded during the gold rush in the late 1800s and named after prospector Joe Juneau, the city has grown into a beautiful city offering a variety of accommodations, good restaurants and transport services. It also serves as the departure point for several wilderness attractions, including Glacier Bay National Park and Preserve and Admiralty Island National Monument. 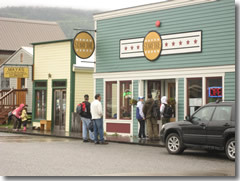 Downtown Juneau provides many sightseeing opportunities that will be time well spent. The Marine Park, a delightful waterfront park across from the Sealaska Building has an information kiosk and provides a walking-tour map. South Franklin Street is a historical district that underwent major renovation in the mid 80s. Juneau is known as the ´Gateway to the Glaciers.´ Among 42 glaciers within a 1,500-square-mile radius, Mendenhall Glacier is perhaps Alaska´s most famous drive-in glacier. The ice floe is 13 miles from the city center at the end of Glacier Spur Road. 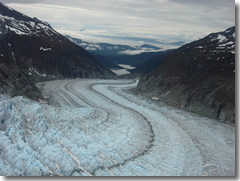 The glacier flows 12 miles from its source, the Juneau Ice field and has a 1.5-mile face. On a sunny day it is beautiful with blue skies and snow-capped mountains in the background. On a cloudy day it can be as impressive as the ice turns shades of deep blue. You can visit on your own or take an organized tour. There is an interesting visitor center at the glacier and several hiking trails in the area. Take the tram to the top of Mt. Roberts for an eagleõs eye view of the surrounding area. Juneau is where you want to take your helicopter tour of the Glaciers. If you take the cruise excursion you stand a chance of getting cancelled due to weather since they typically take the run to Mendenhall Glacier and back. If the weather sets in you have no options. I researched all of the helicopter companies and the one most recommended is Temsco. You can call them directly and they will pick you up at the cruise ship. They are a first class outfit that has been in business for 50 years. I highly recommend you chose the "Pilots Choice" because that tour allows the pilot to take you to his favorite spots and avoid the weather. The popular lunch spot in Juneau is the Hanger. Juneau is also a great place to go whale watching. We did our helicopter tour in the morning and our whale watching in the afternoon. You have to be careful with booking your tour because many of the tour boats resemble giant fishing boats and pack hundreds of people on board. You can actually charter your own boat for the same price or less. We actually went after lunch and walked up to one of the operators and negotiated our own deal with Orca Enterprises. You can book them in advance and have your own boat with an observation deck on top. Skagway is a place with scads of history and little rain, receiving about 26 inches of rain each year making it one of the driest communities along the Inside Passage. Much of Skagway is within the Klondike Gold Rush National Historical Park and many of the buildings and old shop fronts have been restored so the town looks similar to the boomtown it was in the late 1890s. This probably has one of the most interesting downtowns you will visit. You need to rent a car in advance before you arrive in Skagway so that you can drive out to the Alaskan Highway. Make sure you bring your passports when you leave the ship because you will be driving into Canada. Glacier Gorge, Dead Horse Gulch, and Bridal Veil Falls. At the top they see the White Pass at 2,885 feet which is also the international boundary between U.S. and Canada. If you chose to stay in town, there is a hiking trail that leaves from the center of town and climbs up to a small lake that overlooks the port. It is a great hike and if you take it make sure you bring good water-proof hiking shoes. It will be muddy. The best part of the trail is when you hike past the lake to the waterfalls. This is a hard climb so make sure you are in shape if you decide to go. There is a great Thai-Fusion restaurant in town called Firestar. It is located off the main street just past Bonanza Pub, turn right. Icy Strait Point is a very small town on an Island located down the road from Alaska´s largest Tlingit village. You will be dropped off at a fishing warf that resembles a Disney World-like recreation of a salmon cannery - authentic but obviously a recreation. This will be very interesting for kids to tour the cannery. If you are adventurous you do not want to miss taking a ride on the longest ZipRiderª in the world. You will take a 45 minute bus ride to the top of the mountain where you will sail off a 1300 foot drop that carries you over 5000 feet to the bottom. Our only regret is that we waited until the end of the day to do this because we would have done it again if we had the time. You can take a tram or walk to town, but there is nothing there. We did take the walk and there were some great vistas overlooking the cruise ship that made the walk worthwhile. There is also a decent grocery store in town if you want to pick up some snacks. Make sure you stop at the maritime graveyard on the side of the road and read the headstones. Seward is a scenic town flanked by rugged mountains on one side and the salmon-filled Resurrection Bay on the other. It´s the only town on the eastern side of the Kenai Peninsula and probably the only city of its size in Alaska without a hamburger chain restaurant. For that reason, along with its incredible beauty, the rich fishing grounds of Resurrection Bay, access to the Kenai Fjords National Park with hundreds of tidewater glaciers and prolific marine and wildlife, you´ve got to love Seward. Voted an All-American City in 2005, Seward provides everything the Alaskan visitor is looking for - wildlife, glaciers and wilderness. There is a great train ride with glass-top train cars that you should take to Anchorage. The train will wind through the mountains and glaciers on the way. You will see a lot of wildlife including bears and mountain sheep. You should book this in advance through your cruise line. 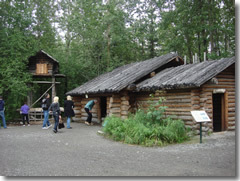 Visit the Alaskan Native Heritage Museum. Try to go early because they close down around 3 pm. The museum has created replica villages of the five native Alaskan Eskimo tribes. Each village has a young native Indian from that tribe who will tell you their story. This is definitely worth the visit. Have lunch at the Glacier Brew House is located on 5th Avenue between H. and G. Street. You should make reservations in advance. The food is great and the micro beers are fantastic. You should really plan to spend 3-4 days in the area and visit some of the most beautiful parks and destinations in North America, such as the Denali National Forest, Prince William Sound and the Kenai River basin. The highlight of our trip to this area was the Hotel Alyeska. Located just 40 miles from Anchorage in the resort town of Girdwood, The Hotel Alyeska pairs world-class accommodations with Alaskan wilderness. This AAA-rated 4-diamond hotel (the only one in the state) sits tucked amid the Chugach Mountains on Alaska´s south-central coast, with a backdrop of glaciers, bald eagles, and towering spruce trees. Outside the hotel, the resort staff has done a wonderful job with the hotel´s mountainside landscaping, including a small pond and plenty of flowers. Just beyond the tram you will find the trailhead for the Winner Creek trail. This is a nice hike suitable for beginners and young children that takes you through the local forests and meadows and down to the local river. The hotel rooms are very nice and decorated with simple elegance. Burgundy and hunter green colors combine with black-and-white nature photography and cherry wood accents. The hotel´s lobby and common areas are quite grand by Alaska standards. There´s even a stuffed polar bear. There are several restaurants located on property, including a great Sushi bar, but the place for foodies is the Seven Glaciers restaurant. This AAA Four Diamond award-winning restaurant sits at the top of the mountain overlooking the resort and is accessed by a totally enclosed gondola from the resort lobby. Offering signature Alaskan entrees in an elegant atmosphere, the Seven Glaciers experience is extraordinary from start to finish. Seven Glaciers is surrounded by nature from every direction with every table featuring panoramic glacier and water views. Chef Jason Porter carefully crafts the Seven Glaciers´ menus with an emphasis on locally available produce, seafood and game. Seven Glaciers also boasts an award winning wine list and full bar. Just down the street from the hotel is a foodies dream called The Double Musky Inn, famous for their prime grade steaks and seafood with a Cajun accent. Originally from the South, owners Bob and Deanna Persons imported Cajun and classic New Orleans cuisine prepared with Alaska seafood, prime grade beef and other fresh, high quality ingredients. Described by Esquire Magazine as the "last great American roadhouseó, the Double Musky Inn is definitely a must for anyone who appreciates great food and a unique atmosphere. If you want to go salmon fishing you may want to try a raft trip for the day on the Kenai and Russian Rivers. It is over an hours drive away, but well worth the time. 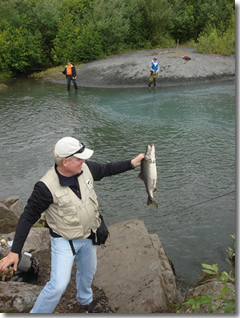 The most highly regarded guide service in the area is Kenai Cache. 1. Good waterproof hiking shoes. Don´t go cheap on your shoes. Alaska is best seen by walking, and it rains constantly so the trails can get real muddy and slippery. 2. Rain coats with hoods that have a zip-out lining. The temperatures vary greatly during the day. 3. Lightweight binoculars with a protective case. 4. A good camera. A lot of people will recommend that you bring a camera with a telephoto lens, but all of the photos in this article were shot with my iPhone. 5. Compact umbrellas for the days you want to walk around town. 6. A lightweight first aid kit. You will be in the great outdoors and it is always a good idea to be prepared. 7. Small backpacks to carry picnics and the personal items listed above. We carried our backpacks every day, even when we went to town, and there were many times where we found short excursions or hikes right from the center of the town (if you wear street shoes to town, remember to pack you hiking shoes). If you plan any back-country hiking, I would also recommend that you buy a small cowbell to hang off your pack. Alaska is bear country and most bear attacks occur when someone walks up on a bear and surprises them. A small bell will let the bears know you are coming and allow them time to move on.